MOST OF OUR HOTNEWS HAS MOVED TO OUR BLOG. MORE NEWS DAN EVER BEFORE... CLICK HERE! Here you can download a new version of SpeleoBase. It introduces a third language, Spanish, and a new and more modern look. Of course, there are other improvements and bug fixes. Indeed, we have been very busy in the Chantoir des Fagnoules the past months. The S5 (Siphon Moche) can now be passed without diving or pumping, and the following sump (S6) can now also be pumped. The exploration behind this S6 has yielded a very important network of galleries. We estimate it to measure at least 500 m, and it is only the beginning. More news in our Blog, or in the pages that relate the story (or is it Saga) of Fagnoules. Well well well! Those Avalon-people must have had some exciting moments, the past few months? So where is the Hot News? Well, yes, we can't complain. Exciting it was. But, as we already have announced, there is now a BLOG. There the news is brought quicker, and by different people. But, to our regret, (and yours), only in Dutch http://scavalon.blogspot.com/. And here you can read the latest Avalon-Flash , with news about the Fagnoules, and about a small (time being!) but nice discovery in Nettinne, the Grotte Mautin. Fagnoules: the saga goes on! 10 June 2007: for most Belgians an important day: national elections. For us, also an important day because today we would try to empty the Siphon Moche (S5). The whole day long we were busy with two heavy pumps, hoses and electricity cables. It was a difficult undertaking: the sump is located far from the entrance, and the river is quite powerful. But we did it! An improvised dam held the water just long enough (15 minutes) to pump the sump and pass it. Risky business... but we could finally see the splendid "Galerie du Temps qui Passe", discovered and only seen by the two divers, (Jacques & Michel). We are already dreaming of pumping the next sump, that gives access to a 15m long room with several interesting possibilities. To be continued! We are very active again in the Lembrée valley, were we have started digging in several sinkholes, such nr 144 in which we are already 7 m deep and 15 m far. In Nr 147, we have already progressed for 5m, guided by a strong, cold draught. Avalon has a publication called Avalon Flash, that appears +/- every 6 weeks. It is nothing spectacular, just a modest collection of texts and e-mail reports about our activities and trips. The redaction is very compact: Dagobert and Paul. But, the fact that the Flash is not published externally is a bit of a shame too, because sometimes it does contain articles that might be of interest for others too! So, we have decided to make a slightly modified version "for the public". Of course, the Avalon Flash is only available in Dutch language. Click here for the one and only Avalon-Flash. We have just returned from a one week caving holiday in the Hérault (Tarassac). 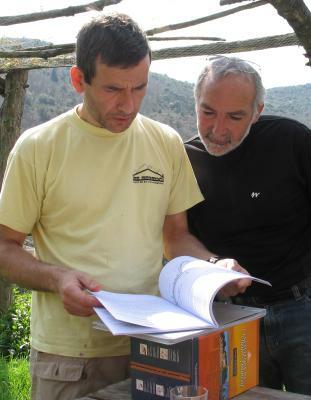 Just a in 2006, we were welcomed by the Spéléoclub de Béziers and more exactly Michel Renda and his wife Marie. Because of the fact that for Michel, no effort is too much to make our caving holiday a success, because of his profound respect for caves and his positive attitude towards cave conservation (the club manages several beautiful caves that are exceptionally well conserved), and because he is such a pleasant person, a true friend, we have made him honorary member of SC Avalon! Again we visited some splendid, decorated caves, but we also did a spectacular river cave, and a sporting trip in Vent d'Anges (-340). And we saw thousand of cave pearls in all possible sizes and colours. Very soon you will find here a new picture gallery and a trip report of our caving camp! How is it going underground...? We discovered two small caves, with an underground river: Welva 1 en 2. To be continued. See picture at the right, after the first exploration (Paul, Annette, Dagobert). We did a possibly important discovery, somewhere else. Wait and see. Icing on the cake: we helped our friends of ESB a few times, in Trou de la Chaise in Yvoir. Together we have opened the access to a second river, in which we explored +/- 200 m of nice and spectacular streamway, with some waterfalls. At another place, we continued a meander that led to a room and an unstable zone. But we can see a well decorated continuation! Finally we have revitalized an old project, the Lembrée valley, and we hope to finish the inventory and topography of all caves in the valley by the end of 2007.
locations. Remark: Google Earth Free does NOT allow import of text files. 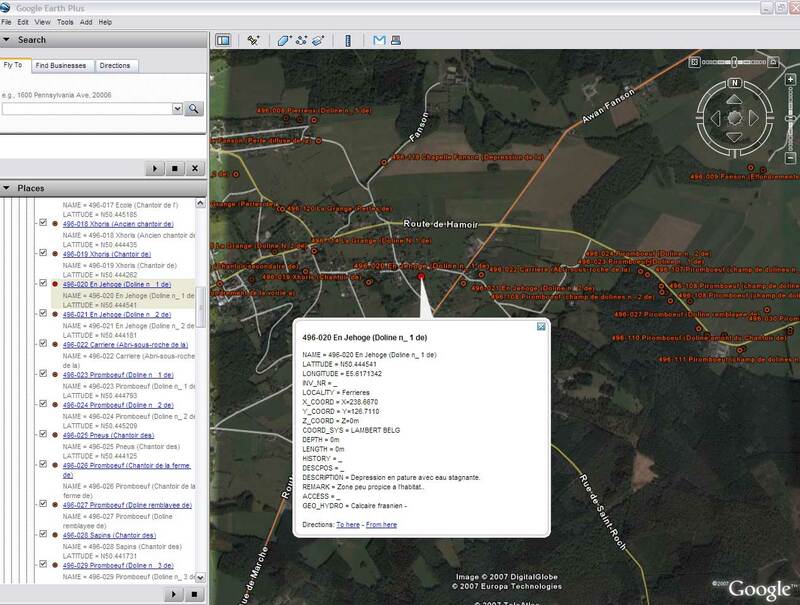 You need to buy Google Earth Plus (20 USD) that allows 100 locations to be imported per file. Look here for a screenshot. The second change is this: you can now install and run SpeleoBase from a USB Flash Drive! SpeleoBase has been made totally independent of the Windows directory. No INI files, no dll's etc. will be used from within Windows directories. So if you put SpeleoBase on a Flash drive, you can use the drive anywhere (any PC) and run SpeleoBase from there. Of course, USB Flash drives are less performant than hard drives, and you risk corrupting the data if you unplug the USB-key before you have closed SpeleoBase. So take care! 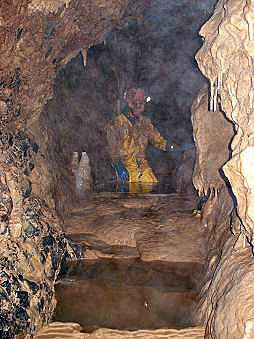 But is is very handy when you are on a caving expedition. Yes terribly busy, I haven't much time anymore to get on with this website. But we are still alive and kicking. A lot of work has been done in two small caves in Hamoir (Norbert and Danielle) and we even discovered a third (even smaller) cave there: Michelle. But none of these 3 caves have revealed their secrets yet. Very slowly we are progressing to what we hope to be a major cave. We are also still working in the Chantoir the Fagnoules. At 3 different places we are trying to shunt the Siphon Moche; the 5th downstream sump that has already been passed by the divers but not by us... Thanks to the fact that we can now pass the Siphon Exterminé (S2) without pumping, we can now visit the entire cave in flood conditions. Passing the sump with only 10 cm of air space is a bit frightening, but after the sump, the raging river is just beautiful and exciting. The 9 m waterfall is impressive. You can hardly believe that you are in a Belgian cave. See this picture of Annette in the Fagnoules river. It has once again been a very busy year for us. You can read about it here, but time being, the report is still in Dutch.